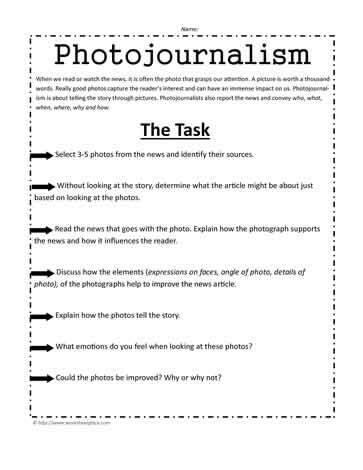 What is photojournalism? When we read or watch the news, it is often the photo that grasps our attention. A picture is worth a thousand words. Really good photos capture the reader?s interest and can have an immense impact on us. Photojournalism is about telling the story through pictures. Photojournalists also report the news and convey who, what, when, where, why and how. Select 3-5 photos from the news and identify their sources. Without looking at the story, determine what the article might be about just based on looking at the photos. Read the news that goes with the photo. Explain how the photograph supports the news and how it influences the reader. photo), of the photographs help to improve the news article. Explain how the photos tell the story. What emotions do you feel when looking at these photos? Could the photos be improved? Why or why not?